Body lice are tiny insects (scientific name is Pediculus humanus corporis) that are spread through close contact with other people. Lice die within 5 to 7 days at room temperature if they fall off a person, but they can live in clothing for up to 1 month. You can get body lice if you come in direct contact with someone who has lice. You can also get lice from infected clothing, towels, or bedding. Lice cause severe itching. The itching is a reaction to the saliva from the insect's bite. Itching is usually worse around the waist, under the arms, and in places where clothing is tighter and closer to the body (such as near bra straps). You may have red bumps on your skin. The bumps may scab or become crusty after scratching. Skin around the waist or groin may become thickened or change color if you have been infected with lice in that area for a long time. Your health care provider will look at your skin and clothing for signs of lice. 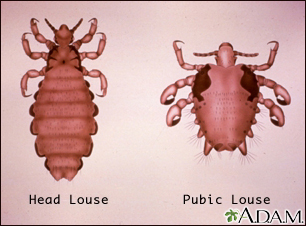 Full-grown lice are the size of a sesame seed, have 6 legs, and are tan to grayish-white. Nits are lice eggs. They will most often be seen in the clothing of someone with lice, usually around the waist and in the armpits. You should also be checked for head and pubic lice if you have body lice. Items that can't be washed, such as stuffed toys, mattresses, or furniture, can be thoroughly vacuumed to get rid of lice and eggs that have fallen off the body. By taking the above mentioned steps, lice can be completely destroyed. Scratching can make your skin more likely to become infected. Because body lice spread easily to others, people you live with and sexual partners need to be treated as well. 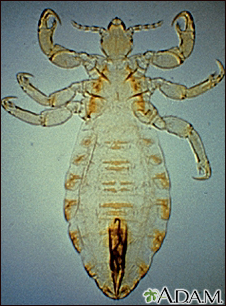 In rare cases, lice carry uncommon diseases, such as trench fever, which may be spread to humans. Call your provider if you have lice in your clothing or itching that does not go away. If you know someone is infested with body lice, avoid direct contact with that person, the person's clothing and bedding. Kim HJ, Levitt JO. Pediculosis. In: Lebwohl MG, Heymann WR, Berth-Jones J, Coulson IH, eds. Treatment of Skin Disease: Comprehensive Therapeutic Strategies. 5th ed. Philadelphia, PA: Elsevier; 2018:chap 184.